You can't hear the person in the seat next to you if they are talking at normal volume. The heat is great during the Winter. We don't run a windshield during the Summer so the heat in the cab was not really a problem for us. But, we live up high so it's not normally really hot during the Summer either. They can be loud but, in my opinion at speed they aren’t any louder than any others at speed. You can’t hold a conversation in a RZR at 35+ either. As for the heat, it’s definately there and if you ride a lot in the summer loose your windshield, it’ll help it escape much quicker, but you’ll love it in the winter! Especially when your hands get frozen from wind chill that little furnace between the seats is a godsend! I installed the floor mats and they did cut down on some of the noise. I started the new Teryx last Friday in the parking lot right next to Yamahas NEW WOlverine Spec-R with that new 850 twin.....and at idle they were both very quiet.....did not get to go above 15 mph in the lot......I thought the Tyrex was really quiet and smooth...as did the wife......we ride with the neighbors in their Vikings.......they are LOUD!!!!!!! I would only put the short half windshield on with no back window which should help with heat issue. Most are saying the heat seeps in from the shifter and parking brake. SOme say from steering column and firewall. The heat and noise just depends on the individual person and what they are used to. Personally I don't think either is that bad on my '15 T4 and comparable to other machines I have been on. I grew up running old school open cab tractors, construction equipment, lawn mowers, and learned to drive in an old Land Cruiser that had nothing but sheet metal between you and the road. I was also in to fullsize off-road vehicles for years and really don't notice any difference in either the heat or noise in the same driving situation. The difference is that in the fullsize rigs your overall average speed is slower, so less engine noise, but also less airflow so it gets hotter. To be honest if the only other vehicle you have driven is a newer car with A/C any SxS will seem loud and hot! I will take purchase of a 19 digital camo later this week and let you know what I observe after some time in the saddle......... Later guys. How quiet is the cab...drivetrain/motor in it compared to your old ride??? Hey, welcome to the forum! You've made a great choice. Did you get the 4 seat or the two? And for what its worth, I run a top, full windshield and a back glass in 90 degree heat and its fine. Congrats on the purchase. Post a pic too. All is real good......smooth, quiet, and it looks HOT!!!! Has the annoying clutch clunking at low speed and downhill........other wise could not be happier. Pic leaving the dealer at Noon today. I agree with the heat. On a 90 plus degree day it is to much. But I’m going to ride anyways. I like riding and I knew they were hot before I bought one. During winter it is great though. I don’t think the noise is that bad. It’s not a car or truck. You’re going to have noise. It’s not that much louder than my RZR was I feel like. Get a good sound system and drown that motor out. I did. Which sometimes I like listening to the machine and cruise without any music. Mine doesn’t hardly have a rattle at all. Poor quality control. I do not agree with that at all. The Teryx is one of the most dependable side by sides out there. That’s why I bought one. It’s been tested and proven. I haven’t had one problem with mine in 1500 miles besides bushings. Yes you are going to have some problems with some. Like anything you are going to here more about the bad than good. But I don’t find that to be true with the teryx. Most people are happy and you don’t here a lot of problems. The most common problem I see is the fuel filter stopped up and they don’t run good. Fuel filter is a cheap fix. Fuel vent mod helps correct that issue though. These things are built like tanks. Also what other manufacturer offers a factory 3 year warranty on an off-road machine? I ride with mostly can-am and Polaris guys. There’s something going on all the time with them. Not always major problems but something. Sorry if you’re having bad luck with your machine. Nice looking Teryx!! That clunking noise is normal. You’ll get use to it and probably learn how to make it not do it so bad. I bought a 2017 t4 and did a clutch kit. When i had all the plastics off I got 12''x12'' heat tape from summit racing and put it on every piece I could. Huge differance on heat. My right leg would got pretty hot but not anymore. That’s what I’m thinking about doing since I got most of my plastics off now. With their lack of facts supporting the description of the Teryx line or Kawasaki brand and their small post count of only 3, I would say this member is a mole for Polaris. I bought my 2015 Teryx4 new and since have placed over 2,000 miles on her. Those miles range from East Texas mud parks, to the Texas Hill Country (nothing but hard rocks) to the National Forests of Arkansas. My machine is mildly lifted with 30" Blackwater Evos. To date, the only issues I have had was a clogged fuel filter sock and two sets of front brakes. After time, they all develop a rattle or two, especially when put in a harsh off-road environment. It is a bit noisy and the heat can be there, especially in the Great State of Texas. However, all suffer those issues to an extent but it doesn't prevent me from ridin'!! In all those miles, I have personally towed many a Polaris, a few Can Am, one or two Yamaha's and a couple of full size rigs out of the woods. But NEVER, have I towed a Kawasaki out of the woods. Im not saying they dont break either. I'm biased towards Kawasaki but it is with good reason and the factory 3 year warrants speaks volumes to me. 2008 green Teryx LE 14" grey Moto Elixer wheels wrapped in Moto MTC tires - sold! 2001 red Kawasaki Bayou - sold! 1973 Chevrolet K5 Blazer 33" all terrains, 19 year work in progress! 1992 red Manco Machines 4 wheeler 5 HP Briggs and Stratton engine with cvt, 2 wheel drive, no suspension - sold! Nice choice. I like the orange. We also bought at Motocity in Anthem. 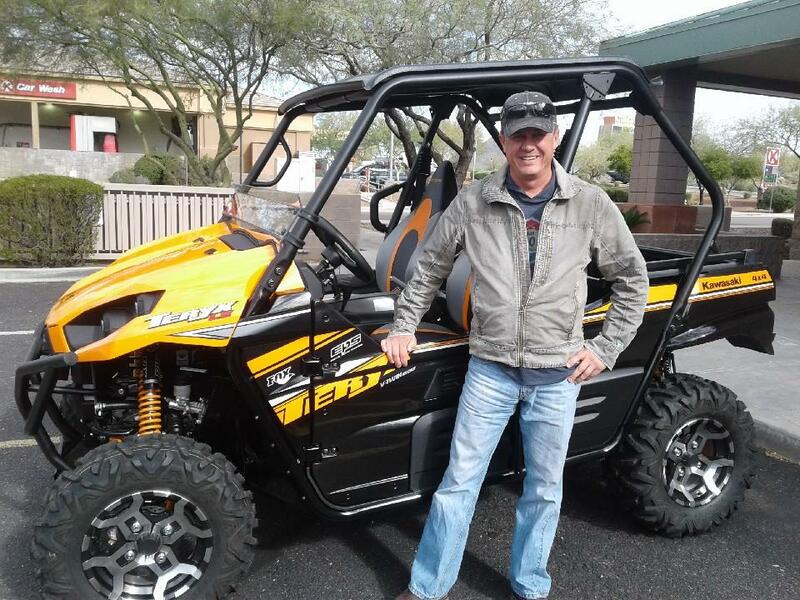 Good people to work with and the real test rides in the desert helped us decide between the Yamaha X4 and Teryx 4 Le. I’m newer to the Teryx world too and I’ve been curious about this same question. So far we’ve had ours out around the neighborhood but haven’t ventured to the mountains here in Utah. With younger kids, I need to wait until it warms up a little. Thanks for all the good feedback! I had a rzr then a Yamaha wolverine and now a 2018 t4 and this is buy far the best buggy i have ever owned hands down my biggest regret is that i should've bought it the first time lol. Enjoy the new toy!!! I have a T4 and as you can see I am not far from you either! Yesterday 08:28 PM by SDSam!